Fri., Aug. 17, 2018, 1:59 p.m.
GENOA, Italy – With anger and grief, Italians began burying some of their dead Friday from the Genoa highway bridge collapse, holding funerals in the victims’ hometowns. Several angry families rebuffed the offer of a state funeral and the cardinal of Naples was merciless in his condemnation of negligence by Italian officials. Saturday has been declared a national day of mourning in Italy and will include a state funeral at the industrial port city’s fair grounds for those who plunged to their deaths as the 150-foot tall Morandi Bridge gave way Tuesday. But many of those who lost loved ones declined to participate in the state funeral. Some cited the need to bid farewell in private while others blamed the loss of at least 38 lives on those responsible for the bridge’s safety. 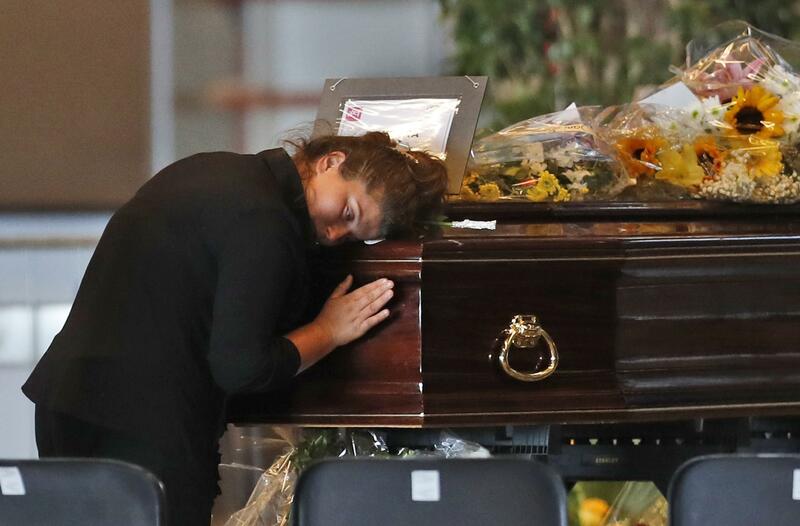 Anger and sadness erupted at the funeral Friday for four men in their 20s, all friends from the Naples seaside suburb of Torre del Greco, whose lives were snuffed out as they drove over the bridge heading to a vacation in Spain. “You can’t, you mustn’t die for negligence! For carelessness! For irresponsibility! For superficiality!” thundered Naples Cardinal Crescenzio Sepe in his homily. Finding the cause of the bridge’s collapse during a driving rainstorm might take weeks or months to determine. But Genoa prosecutors say they are focusing their investigation into possible criminal blame on design flaws or inadequate maintenance on the heavily traveled bridge, which was completed in 1967 and linked two high-speed highways in the city. “I have died inside, but I have to find the clarity of mind to say that four boys were not No. 27, No. 28, etc. (on the victims’ list), but people who loved life,” Battiloro declared. Other private funerals were held in Piedmont and elsewhere in Italy. Survivors, for their part, were shocked at how they escaped with their lives. “It came down, everything, the world came down,” he told the Associated Press in an interview Friday, adding that he managed to walk away physically unharmed but psychologically traumatized. His car plunged nose first, then stopped with a crash, air bags releasing all around him. He said he saw only gray, as concrete dust covered the windows. Capello used the touch-screen phone in the car to call colleagues at the Savona dispatch center, who sent help. He then called his girlfriend and his father, a retired firefighter, who told him to get out of the car immediately for fear that it would destabilize or something heavy would fall on top of it. Since neither the car’s windows nor its doors would budge, he unclipped his seat belt and climbed out through a hole in the rear of the car that was blasted open by the crash. Outside, he said, “there was an unreal silence” – destroyed vehicles and piles of broken concrete and asphalt, but no signs of life, no cries for help. Rescue workers then helped him climb down from the rubble. “The car protected me. Besides God, the car also did its job,” Capello said. On Thursday, prosecutors said as many as 20 people could still be missing in the bridge collapse, but cautioned that some people initially reported as unaccounted for might be on vacation and hadn’t yet contacted their families. Civil protection department officials said Friday there might only be five people missing, but the exact number was fluctuating. Excavators have begun clearing large sections of the collapsed bridge. Rescuers have been tunneling through tons of jagged steel and concrete blocks to look inside crushed vehicles. Several vehicles, abandoned by their fleeing occupants on the intact ends of the bridge, were gingerly removed Friday. Among them was a green food delivery truck, which – its windshield wipers swishing, its gear shift in reverse – had halted only few yards from the jagged edge of the abyss. For many, the truck at the brink became a symbol of destiny and survival. Highway workers, directed by firefighters, backed it off the bridge and into a nearby tunnel. Authorities are worried about the stability of large remaining sections of the bridge, which was built over or adjacent to several apartment buildings. Hundreds of residents in those buildings have been evacuated – and there is no guarantee they will ever return to those homes. Emergency workers also want to quickly remove the tons of debris that fell into the dry riverbed under the bridge so it doesn’t create a dam that floods the rest of the city if heavy rains fall again. Published: Aug. 17, 2018, 1:59 p.m.